Keeping our skills up to date is really important in dentistry. What you learned 14 or 15 years ago in dental school soon gets overtaken by new techniques, new materials and better scientific evidence. Believe it or not, continuing education is still not mandatory for dentists in Ireland (it should be!) but we certainly have a moral obligation to our patients to keep learning. So when myself and Mark had the chance to spend a day with world-renowned root canal specialist and educator Dr Cliff Ruddle, we jumped on it! Dr Ruddle is a very passionate speaker. He loves root canals! He also doesn’t take himself too seriously, which is always refreshing. The series of lectures was excellent, with over 40 dentists and root canal specialists (endodontists) present. The audience was split about 50:50 between dentists and specialists. Dr Cliff Ruddle. Lots of energy, lots of arm-waving, very little formality! The afternoon included a hands-on session to let us all further explore the latest root canal techniques and equipment. Mark getting hands-on. Hi-tech root canal motor system is familiar; we already use one! Obviously we don’t want to “experiment” on actual patients! So we used clear perspex blocks instead. These let us see exactly what we’re doing, which makes life much easier. Plastic is much harder to shape however; real teeth are often easier! 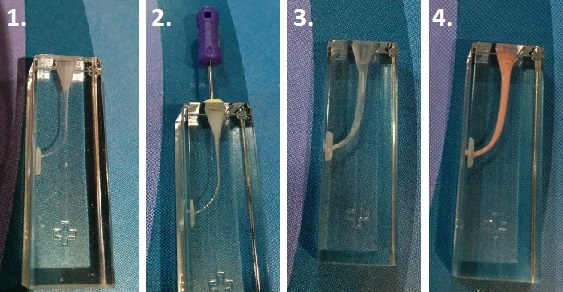 The sequence of photos below shows some of the steps involved in the process. Have a troublesome tooth and think you might need a root canal treatment in Dublin? We’re always happy to see new patients. You can book an appointment online or call our reception team at 01-6655900. And as always, you can email us at info@shelbourneclinic.ie – during office hours we always aim to respond to queries within 30 minutes.